Dr. Atkinson, who is currently the longest serving state K-12 educrat, has decided to run for re-election again. 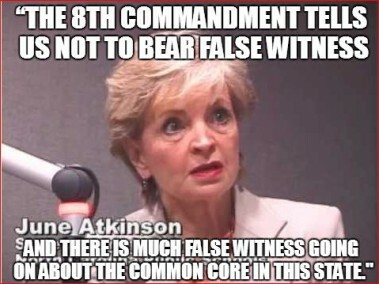 In the past, Dr. Atkinson has accused parents and citizens opposing Common Core as “bearing false witness“. In the coming months, we’ll see just who is really bearing said “false witness”. So, in an effort to make sure the people of North Carolina know what they are getting, this video is one of many to come and will be an ongoing series throughout the 2016 election cycle. Keep an eye out for #StuffAtkinsonSays. Testimony from NC Superintendent Atkinson on Race To The Top during the 2013 NC General Assembly Legislative Research Committee meeting. This entry was posted in EDUCATION, ELECTIONS, June Atkinson, LL1885, The Articles and tagged #StuffAtkinsonSays. Bookmark the permalink.